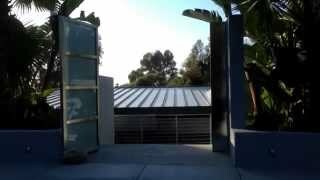 Mulholland Security Stainless Steel Gate Review | 1.800.562.5770 http://gateslosangeles.com Not exactly the kind of thing that you see us doing, but I thought there might be others who like the idea. Others were looking for added security and safety. It does not matter why, whatever your reason, our fence_gate contractors can make your vision become true. Our emergency gate repair service is on call twenty four_seven. "The Sterling" Stainless Steel Entry Gate | Mulholland Security Los Angeles 1.800.562.5770 "The Sterling" Stainless Steel Entry Gate, design and installed by Mulholland Security. Using marine grade stainless steel, the gate is corrosion free. Stainless Gate Los Angeles Protect Privacy, Enhance Home Gates Los Angeles is a division of Mulholland Security Centers, Inc. We have been in the security business for 18 years and have fabricated and installed security gates for hundreds of Southland families and businesses. At Gates Los Angeles Automatic Gate Repair Company in Studio City California we offer all of these great driveway gate services for our great community. Welding Stainless Steel Gates Brief Demonstration Welding stainless steel requires different skills and equipment than conventional metal. This very brief video will give you some insight into this. Bending stainless steel for use in residential gates Los Angeles http://gateslosangeles.com. Avi Ben David gives us a tour of our metal shop where stainless steel gates are fabricated. The stainless steel used in the gate that we are making here will have two tones and will be highly reflective. 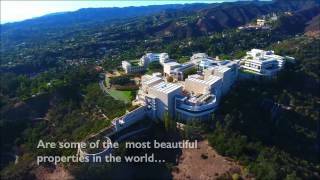 Gates Los Angeles is a division of Mulholland Security Centers, Inc. We have been in the security business for 18 years and have fabricated and installed security gates for hundreds of Southland families and businesses. Beach Stainless Steel Gate Nearing Completion La Jolla CA. http://gateslosangeles.com. 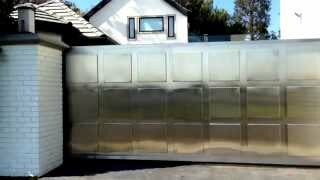 In this video we show nearly complete stainless gate to residential property, with opaque glass inserts. Or use of glass in this project is quite unique in that we inserted the glass and have framed it in such a way that it is not requiring a calk or silicone bead to keep the glass in place. This La Jolla property is quite close to the beach. The stainless steel we are using here with prove to be corrosion and is going to beautiful for years. 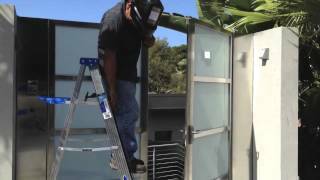 Stainless Steel Residential Gate - San Diego Video 2 Want help on your gate project? Happy to advise or do the work for you: http://gateslosangeles.com/free-estimate.html Mulholland Security Gates. We design, engineer, fabricate and install stainless steel gates and fences throughout S. Cal. This is second in a brief series showing gate being installed in San Diego, less than a mile away from the beach. The anti corrosion characteristics make it ideal for beach environments. Our installations are systems with all modern "extras" including intercom, remote access, cameras, etc. Mulholand Security Center, Gates Los Angeles Stainless Steel Gate Testimony http://GatesLosAngeles.com Testimonial for the installation of a stainless steel gate and fence project. Security walk through, Gates & fences, door's hardware Specialist- Locksmith, Security Camera systems-CCTV, Access control, Intercoms, Home automation, alarm systems, alarm monitoring. And all security hardware systems integration! Sliding Gate vs. Swing Gate Installation Burbank, CA Gates Los Angeles is a division of Mulholland Security Centers, Inc. We have been in the security business for nearly 20 years and have fabricated and installed security gates for hundreds of Southland families and businesses. 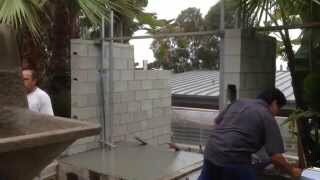 In this video we show a sliding gate being installed and compare it to the more conventional swing gate. Avi Video Intercom and Remote Access Gate Opener http://gateslosangeles.com Avi Ben David demonstrates the use of a a video intercom to view people at your gate or door and to allow or disallow access to them. At Mulholland Security's Gates Los Angeles, we have all the gate accessories you require including electronics. We are specialists at low voltage installations and warranty all our work. 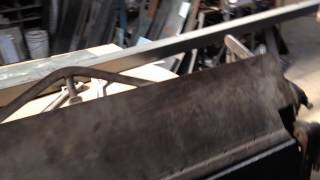 Iron Gate, Stainless Steel Gate Fabrication, Thickness of Metal http://GatesLosAngeles.com In this video, we are given it to her of our fabrication shop and we learn a little bit about the gauge or thickness of metal utilized in our iron and stainless steel gates. Stainless Steel Gate Hinges Being Made for Custom Driveway Gate in Los Angeles http://gateslosangeles.com. We looked all over, but we couldn't find a hinge that looks right and could support the weight of a gate we are building in San Diego. So, in circumstances like this, we go to a very efficient machine shop and have our parts specially made.